Let us cater your food, while you focus on your event! Work with one of our representatives to create your own customized entree buffet. Service includes set up of food in chaffing dishes and fuel to keep everything hot, serving utensils, forks, napkins, chips and salsa are included. Customer keeps the equipment for the duration of the event and we pick up later at specified time. Please give us a week notice for catering event. Service is available within a radius of any participating Las Casuelas Locations. Please call your nearest location. Please place your order at least 24 hours in advance, so we can prepare your food. All pick ups are served in aluminum containers; forks, napkins, chips and salsa are provided with every pick up. Host your next celebration or event in our private banquets. Please call in advance to reserve your date as each location books fast. Minimum of 40 and a maximum of 80 people. It has its own buffet servicing station. Media Center, including a 100” projection TV and a second 40” TV, surround sound, wireless microphone & internet connection. We can even set up your computer to play whatever you wish. Ten round tables that seat six to eight people, including white tablecloths and dinnerware. The banquet facility in Modesto will accommodate up to 40 to 50 people and has its own 40” TV. The Las Casuelas in Ripon is unique as it has its own outside patio area that will accommodate up to 20 people. Fundraising with Las Casuelas is fun and easy! 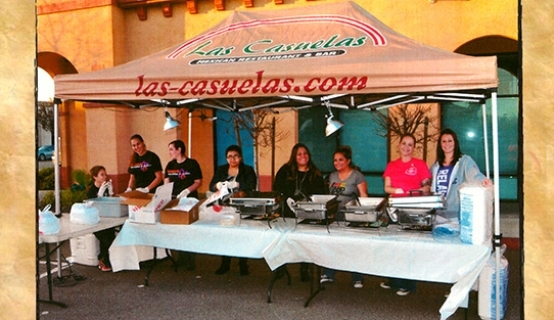 Las Casuelas wants to support our communities. Let us help you raise money for your organization. We provide the food, containers, utensils and you provide the help. Minimum 200 tickets. It’s as easy as driving to your closest Las Casuelas and picking up the food. The customers don’t even get out of their cars.